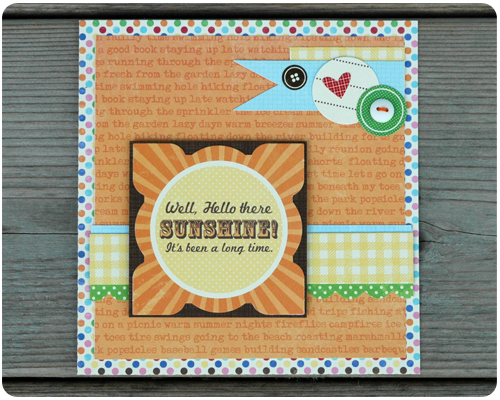 Crafty Cucumber: Card of the Week: Well, Hello there Sunshine! 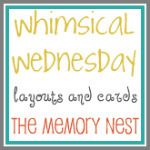 Card of the Week: Well, Hello there Sunshine! The weather this weekend was just gorgeous. We spent most of our days outside - working in the garden, eating lunches on the deck and just feeling the warmth of the sun at long last. I did manage to sneak inside for a bit on Sunday afternoon to make this card...totally inspired by what was going on outside. The paper, die cuts, and stickers are all from the Watermelon Gazpacho Soup line by Jillibean Soup. I love Jillibean Soup - awesome colors and patterns on the papers, and such an incredible selection of embellishments. This one of the paper companies that I do not hesitate buying an entire line from. Well, the gorgeous weather is calling me outside again and I must listen. Rachel, what a great card. Love how you combined all the different patterns and colors. Love it! Thanks Leslie. I had a bunch of tiny paper scraps and everything just came together to make this card...love when that happens. You are just good at making things all come together. Thanks for linking up!! This card is so fun! It will brighten someone's day for sure! Thanks Michelle. This card was a lot of fun to make. This is the perfect summer card! Great job! such a happy and pretty card! It's fabulous! Thank you for stopping by Raechelle and for your sweet comment.